There’s a whole bunch of reasons people like your posts, some of which you might not “like” and we’ll touch on a couple popular ones here. Friends, co-workers, bosses, etc. will generally throw a like your way if you pop up in their feed out of sheer respect for you as a person. More often than not they could give 2 shits about what you’re actually saying in your post but the fact they think you’re a solid person, well, that’s worth a like. If you think I’m wrong go ahead and take a look at a few of your recent posts and who liked them. Chances are there’s going to be a lot of consistency there and it’s not because that segment just gets you, it’s because they fall into one of the categories above. See a few people you don’t know in there liking your stuff? This rare occurrence happens when someone is “setting the table”. They’re building (in their minds) rapport with you so they can contact you at a later date with their own agenda or product/service to sell you so do them the favor of a kind response in recognition of their efforts because you may be on the other side of that fence at one point. People are selfish, shocking we know. You’ll most typically see this scenario with co-workers or boss-employee relationships. If you follow any higher-end executives on LinkedIn with sizable organizations you’ll know exactly what I’m talking about here. Your feed will be littered with “like diarrhea” (trademark pending) from their various employee’s posts talking about how great everything is. Many of you know the exact reason they do it but for those who don’t, it’s called marketing. Whether you like the posts you’re seeing or not, you’re still seeing them and so are the rest of their connections leading to people like myself writing an article like this talking about it, so it’s working. 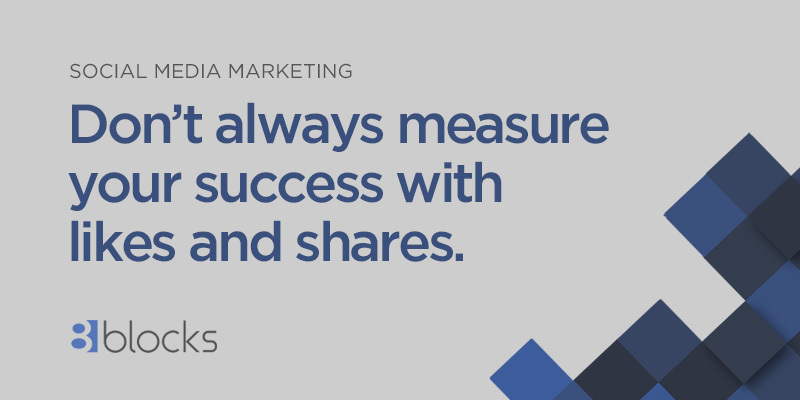 So then what is the measure of success for social media marketing? Consistency. Both in growing your audience and engaging with that audience. Whether you’re getting comments, shares or likes, continue growing your audience and posting content to that audience and you will see results. More often than not those results come from a random email or phone call from a friend or follower looking for your product/service because of some random post you did about being pissed off about last night’s game. But how would something like that lead to business you ask? That’s very simple; they already wanted to do business with you, they just needed a reminder that you existed and how you could provide benefit to them and vice-versa. More eyeballs = more everything so get out there and make sure people know that you exist.